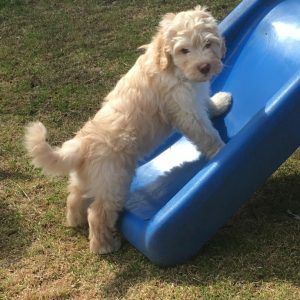 All of our Australian Labradoodle Puppies will be Ready To Go Home In Time For Easter! 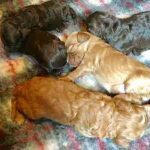 We currently have two litters of labradoodle puppies available – One beautiful boy from smaller Carmella’s litter and several boys of different colours and one apricot girl from Bella’s small medium litter. Carmella is so happy and proud to have a family of six beautiful puppies. 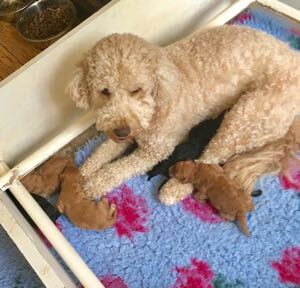 Three of her puppies have red/gold colouring. Carmella and her mate Cagne will have puppies in the 20 pound range. She is 27 pounds and Cagne is 18 pounds. She has a curly wool coat which is great for allergies and Cagnie has a more relaxed, silky coat which is also allergy friendly and non-shedding. The puppies were born February 13th and there is just one available puppy, phantom black and gold Cyrano who is ready for his new family. Cyrano knows how to come, sit for his kibble, go potty in an appropriate place and sleep in his crate all night long. Bella and Cagne’s puppies will have curly to wavy non-shedding coats. They will be allergy friendly. Cagne is a small young man at 18 pounds and Bella is 35 pounds. Puppies will be in the 25 to 30 pound range. We have eight little boys, black Slate, Shale and Flint who has a white mark on his chest, pale gold Jade and Jasper, cream Rocky and chocolate Garnet. The girls are cream Opal, gold Goldie and brown Amber. All of the puppies will have solid non-shedding coats. Bella is quite curly and so non-shedding. She has the wonderful temperament of her mother, Lexi. 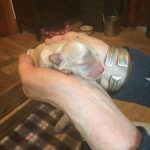 Many of Bella and Lexi’s puppies have gone on to be therapy and working dogs as well as pampered house pets. 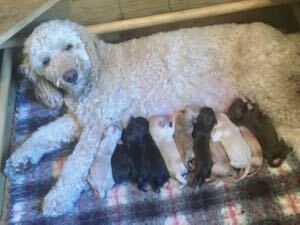 Bella has a large mixed litter of 11 beautiful puppies. She is a hard working mother. We know the power of internet romance with a puppy and we really do try to place the puppy you love with your family. 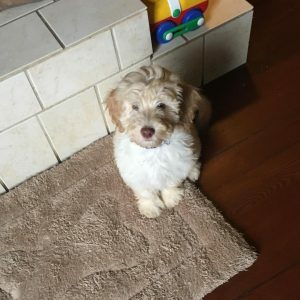 However, if the puppy is on the shy side and you have young children or if you want to jog and your chosen puppy doesn’t have the best knee joints for athletics we will discuss this with you and sort out which puppy would be happiest in your family. 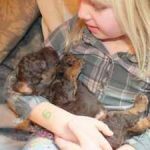 We have two skilled dog trainers who come to evaluate the puppies at 8 weeks. 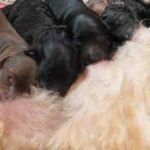 After this we will discuss with you the traits and proclivities of each puppy that might work for your household. It will most likely be the very puppy you fancy but we want to make sure everybody is happy in the long run. We introduce puppies to sleeping in a crate and teach them to come and sit nicely as part of our Head Start Puppy Training Program. 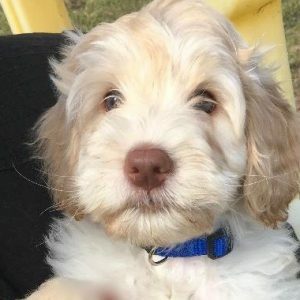 Our puppies will be neutered, microchipped for identification and have had two out of three sets of vaccinations before they go home at 10 weeks. Puppies meet a minimum of 50 different family and friends during their first 10 weeks to ensure they happy and well socialized. 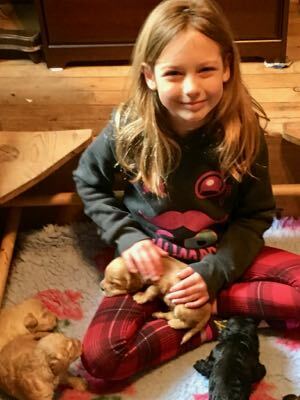 Our puppies stay with us until they are between 9 and 10 weeks. 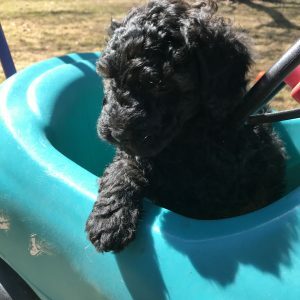 At this time they have had their Head Start Puppy Training and are ready for their family to pick them up or for travel.